Kids love dinosaurs. There is no question of that, there never has been a shadow of a doubt about that, and they always will love dinosaurs. There is something about the huge, fierce creatures that excites the imagination of a child like nothing else. In animated series, you can always tell when they are running out of ideas when they turn to the classic standby, dinosaurs. With the Disney Renaissance behind it, Walt Disney Feature Animation was grasping for ideas, so where did it turn? To dinosaurs. Specifically, "Dinosaur" (2000), directed by Ralph Zondag and Eric Leighton and produced by Pam Marsden. With backgrounds found in remote Venezuela, the Disney movie animation team completed the film using cutting-edge computer animation. 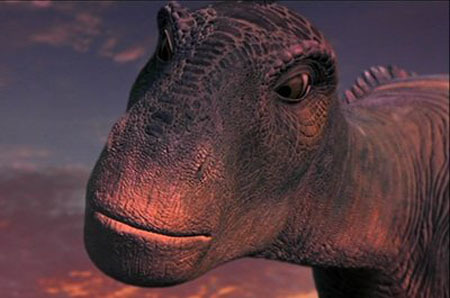 By blending real backgrounds with the artificial dinosaur characters, the animation team was able to create a "photo-realistic" look that enhances the viewer's immersion in an alien world. Disney spent a ton of money on the computer animation for a fairly pedestrian story on the assumption that the graphics alone would ignite the public interest. A Carnotaurus attacks an Iguanodon nest, forcing the mother to flee. One of the eggs survives intact, and it is taken by a Rinchenia who drops it in a river. A Pteranodon grabs it and takes it to an island populated by lemurs. 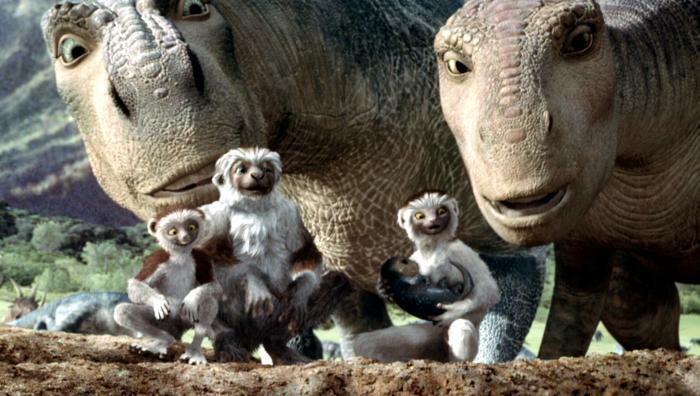 The egg hatches, and the lemurs name the baby dinosaur Aladar and raise him. 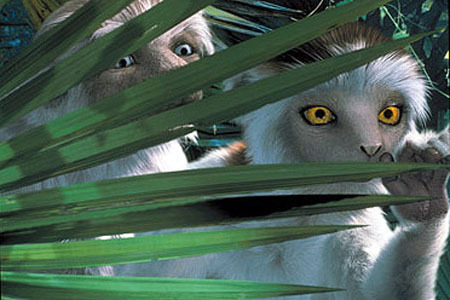 Years later, the island is hit by a meteor shower that destroys the island, and Aladar and his lemur mother Plio, grandfather Yar, best friend Zini and his sister Suri must swim to the mainland to survive. With the island gone, the group has to learn to survive in a hostile world. They are attacked by a pack of Velociraptor but escape, and later run into a multi-species herd of dinosaurs, which they join. The pack's leader is Iguanodon Kron, and his minion is Bruton. Kron and Bruton are taking the pack to the fabled "Nesting Grounds," a place of peace and serenity untouched by the meteors. Also in the pack are Baylene the Brachiosaurus, Eema the Styracosaurus, and Eema's pet Url, an Ankylosaurus, with whom Aladar and his group become friends. Aladar puts the moves on Kron's sister Neera, but she rejects him. With the group established, they head on toward the Nesting Grounds. 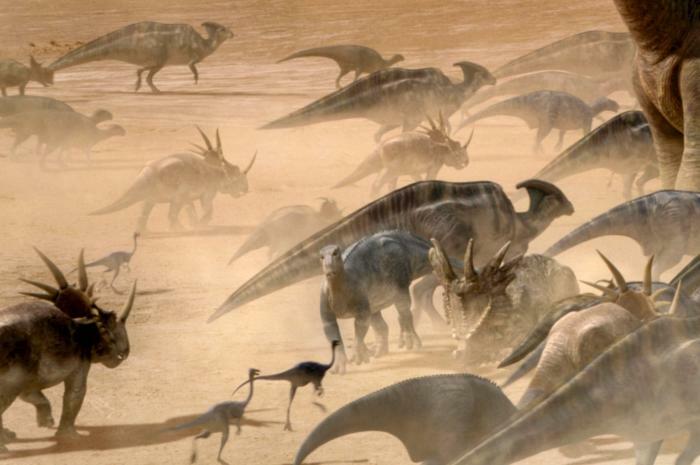 The Velociraptor pack continues to track them for a while, but depart when two Carnotaurs also begin following Aladar's group. 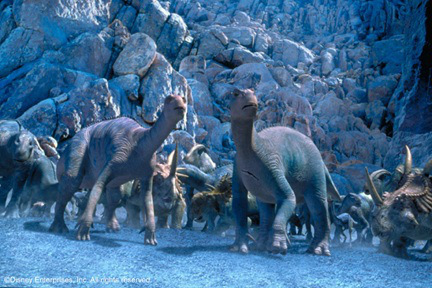 Needing water and reaching a lake that has dried up, Aladar and and Baylene dig up some water for the group. This impresses Neera, who falls in love with Aladar. Bruton, who went looking for water earlier, returns injured by the Carnotaurs. 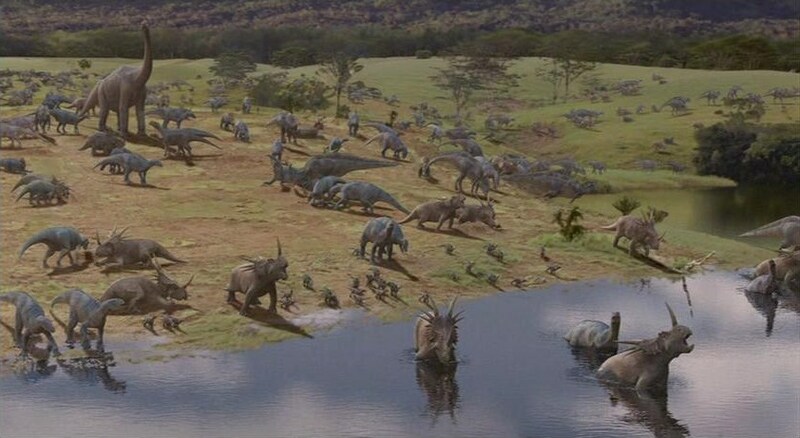 Kron immediately takes the majority of the herd away to escape the Carnotaurs, leaving Aladar, the lemurs, Baylene and Eema, and the injured Bruton behind. The group takes shelter in a cave, and Bruton warms to the others. The Carnotaurs attack, and Bruton holds them off while the others flee deep into the caves, losing his life in the process. The group reaches a dead end in the cave, but everybody jumps in to help break through the wall. Beyond the blockage is the Nesting Grounds they were seeking all along. 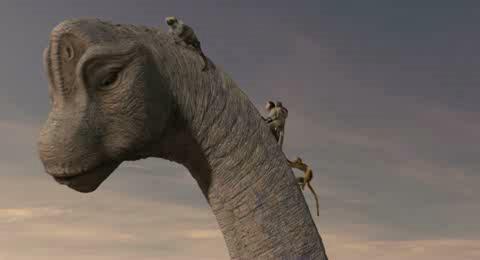 Aladar goes through and finds the herd led by Kron, who has ordered the group to climb some rocks. Aladar sees that this is highly dangerous, so he advises against it. Kron, his authority challenged, fights Aladar for supremacy and defeats him. He is only stopped from killing Aladar by Neera. Neera and Aladar then take over the lead of the herd, but a Carnotaur that escaped from Bruton earlier attacks and the group has to stand its ground to fight it off. The Carnotaur sees Kron climbing the rocks by himself and attacks, fatally wounding him, but Aladar manages to push the Carnotaur over a cliff. 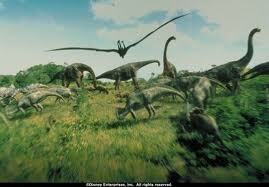 Aladar and Neera then lead the herd on to the Nesting Grounds. There are no major stars in the "Dinosaur" voice cast, but everybody does a competent job. D. B. Sweeney is Aladar, while Ossie Davis plays the elderly Yar and Alfre Woodard is Plio. Julianna Margulies is Neera, Aladar's girlfriend, while Max Casella has the "wisecracking friend" role of Zini. Hayden Panettiere plays Suri, while Samuel E. Wright is Kron and Peter Siragusa is Bruton. Joan Plowright as Baylene and Della Reese as Eema round out the leads. "Dinosaur" adopts the same formula as "Tarzan" had the previously year: low-profile voice actors, a rote story, and absolutely stunning animation. In terms of audience response, that tactic worked better for "Tarzan" than for "Dinosaur." The problem was that, in order to make the plot understandable, the producers felt it necessary to make the dinosaurs talk. With all of the effort put into making the dinosaurs look as realistic as possible - and they look very realistic - the illusion is completely destroyed the moment that they open their mouths and started cracking jokes. Disney seemed aware of the contrast and tried to hide it by keeping the opening sequence with as little speech as possible, and the trailer has very little as well. The opening sequence makes up most of the trailer. This made people think that a very realistic tale awaited them, when the rest of the Disney movie with talking dinosaurs undermined that idea. The voices of the dinosaurs did not match their majestic profiles, so that was another contrast that the production had to overcome with its audience. 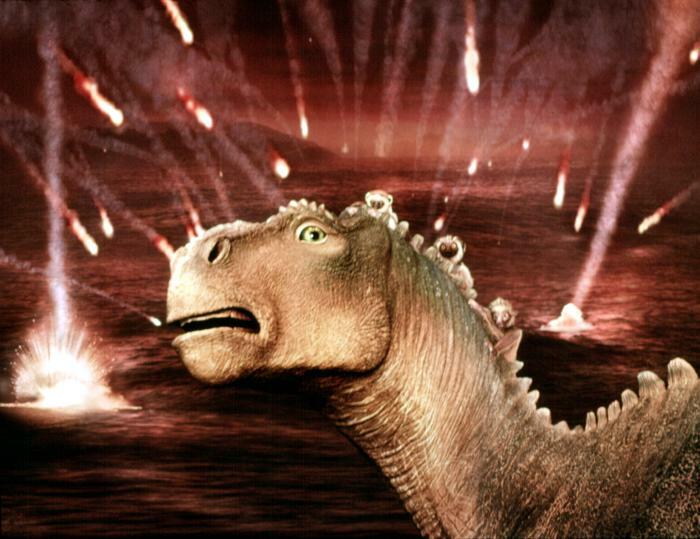 The dinosaurs also wind up walking through a barren wasteland because of the meteor devastation, which is a far cry from the lush vegetation seen in the opening. The plot itself is very simple and straightforward, enough to keep many children satisfied but a trial for many adults to endure. All these faults aside, a greater threat emerged that kept "Dinosaur" from becoming a bigger hit: competition. Pixar and DreamWorks were both releasing hit films, and Don Bluth had done the dinosaur idea very capably with "The Land Before Time" (and there are many, many similarities between that film and "Dinosaur"). Even Disney itself had, in "Fantasia," crafted impressive animated dinosaurs, while "Jurassic Park" had mined the dinosaur idea to death, with its sequels continuing to come out ("Jurassic Park IV" is due out in 2014). 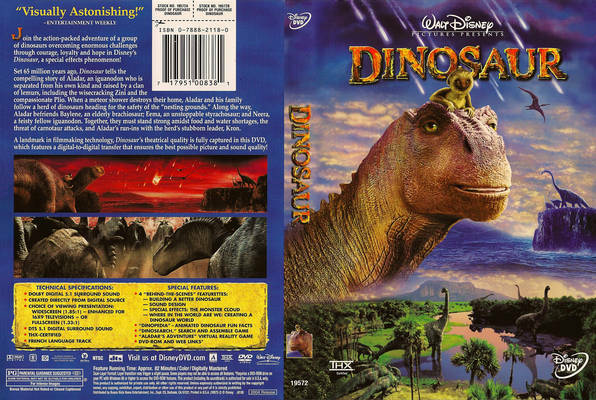 The bottom line for this Disney movie was that simply throwing out a dinosaur film, however well-crafted the dinosaur animation, was not enough to win an audience in 2000: there had to be a complete Disney movie with sympathetic characters and an intriguing plot, not just great computer animation. Whatever was required to turn a profit, "Dinosaur" had it. "Dinosaur" made a tidy sum of money for Disney. It grossed $137 million in the States and $349 million worldwide, over 2.5 times the estimated $127.5 million it cost to make. Thus, just like "Tarzan," "Dinosaur" also wound up making money despite its high production costs. The film since has been released on DVD and Blu-ray. There are many good things to note about "Dinosaur." The score by James Newton Howard, while it did not produce any hits, was well-suited to the material. 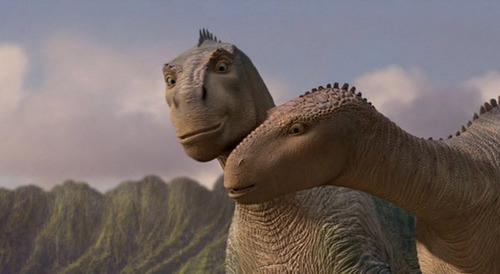 The animation team tried to be as accurate as possible in depicting the dinosaurs, but virtually every dinosaur film takes liberties with the historical record, and "Dinosaur" is no exception (for example, lemurs and dinosaurs did not exist at the same time). 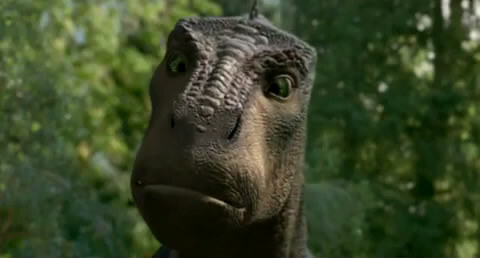 Dialogue was added at Michael Eisner's insistence in order to make "Dinosaur" more popular, and the strategy worked. 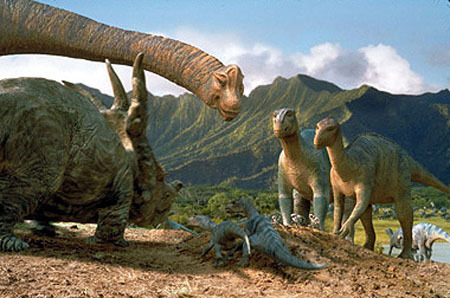 The basic reason for "Dinosaur"'s attraction is that the themes of cooperation and compassion run through the story. Aladar does not try to insist on his own way, like Kron, and compassion turns out to be an advantage throughout "Dinosaur," not a disadvantage. Building alliance by being a "nice guy" works better for Aladar than being an authoritative loner does for Kron. Aladar owes his life to the compassion showed towards him by the lemurs, and he repays that to others, benefiting everyone, which is a positive message. If you are looking for a completely realistic dinosaur Disney movie, you won't find it in "Dinosaur," nor will you find a plot that will keep you riveted. The dinosaur group walks, talks, walks some more, talks some more, has a fight or two, and that's about it. Nothing too grand. However, "Dinosaur" is an entertaining Disney movie if you are not too demanding, one that entertains while showing a little of what life might have been like 100 million years ago. "Dinosaur" got Disney movies off to a good start in the 2000s, and "Dinosaur" remains a stirring Disney movie with awesome visuals that anyone can enjoy if they give it a chance.